Yesterday was one of the first real wintery days we've had - rainy, chilly, grey and windy. Let's hear it for London winters! But I arrived home with two whiny children in tow to find a very large package waiting for me. Inside the package was a metric buttload of pretty fiber. HYFC Timber Romney, September 2010. 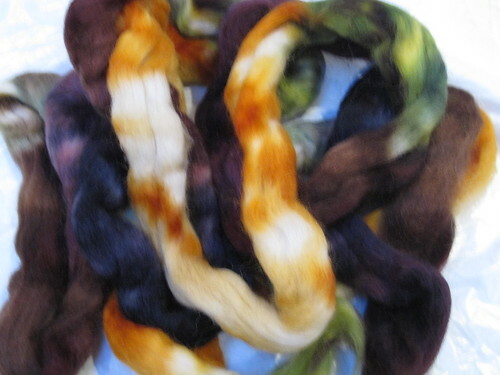 I was so taken with the photos of this fiber online that I ordered four more bags before mine even arrived. I have visions of handspun garter stitch sweater in my head. HYFC Burrows Rambouillet, October 2010 offering. This fiber is so gorgeous, and it reminds me of the sea on a stormy fall day. Greys, pale green, pale blue, dark grey, brown. It is stunning. 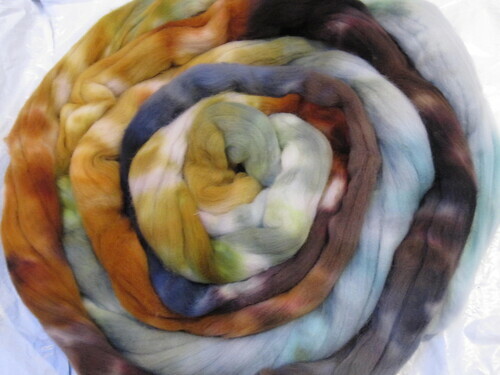 I still haven't spun up my first Rambouillet, which was also a fiber club installment. I have no idea what I'm going to do with this but it is incredibly soft and cushy, even in top form. Then there was the big deal - my Shelburne Falls Hat was randomly selected for a prize in the 4! Oz! Challenge spin/knit-along this fall, and my prize came in this big bag. 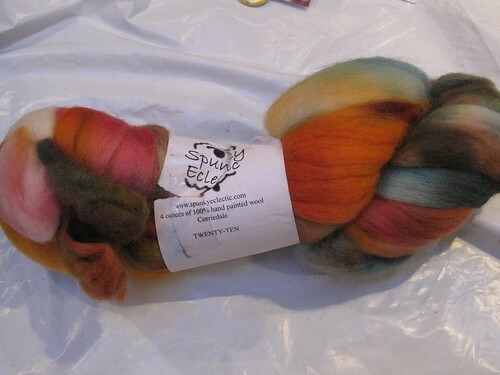 First up is Corriedale in the colorway Twenty Ten from Spunky Eclectic. Lots of oranges and pink, with some darker blue and brown thrown in. Totally not colors I would have picked out for myself, but totally amazing. Next is Happy Dance Shetland from Hello Yarn. Happy Dance indeed! 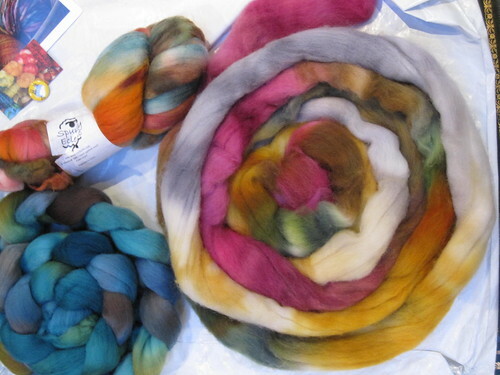 I love shetland, and I can't wait to spin up these gorgeous colors. Dev might even go for this yarn - she can not get enough pink. Still (as an aside, I know she's my daughter because I distinctly remember her arrival, and I'm pretty sure they didn't switch her at the hospital, but where did this pink thing come from? Or is it just a little girl thing? Will it pass eventually? Please?). 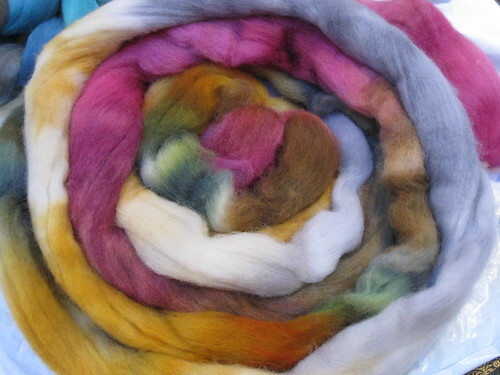 Last, but certainly not least is the Southern Cross Fibre offering: Cairns Polwarth. I'm not sure where to begin except to say that David could not have picked a colorway I would adore more if he'd known me from birth (the colors are much better in the first picture of all three). 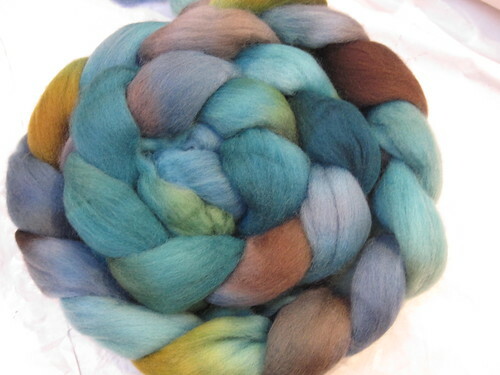 And Polwarth! Excuse me while I go have a little lie down until the blood returns to my brain. I want to thank all of the people involved in the whole Challenge - the dyers for doing what they do so well, and the moderators Stacie and Maryse for organizing the whole thing. It was such a fun experience to spin with a design in mind and actually see it through to the finished project. I can't wait for next year! Written by porpoise On November 10, 2010 In "4OzChallenge", "spinning", "stash"